Filed to: Omg puppies!Filed to: Omg puppies! 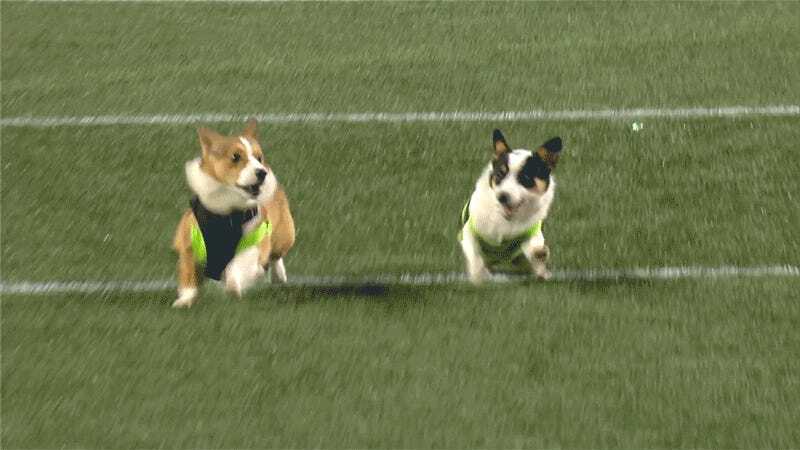 Here is a true thing: Even the fastest corgi still looks like an absurd tubelike dog-snake hybrid. The Seattle Seahawks attempted to prove this with the 2018 Corgi Cup, which was held during halftime of Monday’s game. There were so many bread-shaped contenders that they had to hold two heats. In the two-up final, Napoleon narrowly beat Treason, who probably could have won had their herding instinct not kicked in super hard and led Treason to just kind of herd Napoleon safely to a gold medal. Congrats to Napoleon, whose prize for winning is a backup running back roster spot on the Seahawks. Good thing for him: they get to beat up on the Niners this weekend.